Supplementary material reads: "For: Continental Air Lines. For Immediate release. 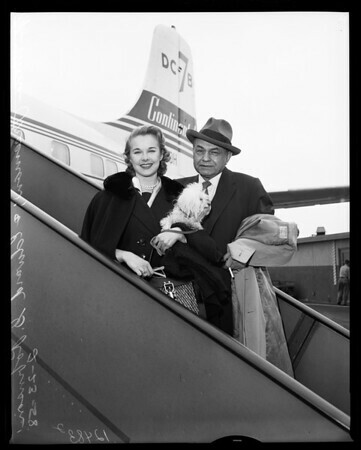 Edward G. Robinson and Mona Freeman arrive at Los Angeles International airport Sunday afternoon on continental Air Line's flight from Denver where the two film stars closed out their engagement of the 'The Middle of the Night,' to open Tuesday at the Biltmore Theater. 'The Middle of the Night' is Miss Freeman's first stage role but a familiar return to the board for Robinson, who has starred in the two-year Broadway run of this Paddy Chayefsky play."